Here is a complete list of all updated Airtel Data Plan in Nigeria for 2019, price and subscription codes. The “smartphone network” as it’s fondly called is one of the fasted network for browsing the internet either with your Android smartphone, modem or PC. So if you are searching for a comprehensive list of new Airtel NG data bundles currently working at the moment, this article is definitely for you. Airtel Nigeria offers different data bundles including daily data plans, weekly data plans, monthly data plans, night plans and even mega plans for heavy internet users. Customers have more than enough options to choose from when it comes to data subscription on the Airtel network. Airtel also offers various products and services such as 2G, 3G and 4G mobile services, Fixed line, high-speed broadband through IPTV, DTH, DSL, enterprise services including international and national long distance services to carriers. Just like other networks, Airtel introduced a short code for easy data subscription which is *141#. Once this code is dialed, your phone will display all the available data plans on the network and you just have to follow the on-screen instructions to activate your preferred plan. Globally known as Bharti Airtel Limited, the Nigerian section of the mobile network has over 20 million customers on its database. It’s also available in over 20 countries in Africa and Asia. Airtel is powered and driven by the vision of providing affordable and innovative mobile services to all, with the aim of offering cheap Airtel Data Bundles to its subscribers. For this reason, Airtel NG introduced a double data and Airtime promo called “Smartconnect” that gives new subscribers twice the value of their data bundles and credits. We will discuss more about this later on this page. In case you don’t know, Airtel now gives 75mb for N100 instead of 30mb for N100 in its daily data plan. Also it gives 200mb for N200 instead of 100mb for N200 for the 3 day plan and so on. As you can see, the data bundles has really been reshuffled and improved in 2019. Let’s see the full list below. N100 for 75MB: This is a daily plan that gives you 70MB for just 100 naira and it is valid for only 24 hours. To subscribe, dial this code *410#. N200 for 200MB: This is a 3 day plan that gives you 200MB for just 200 Naira and it’s valid for 72 hours. To activate, dial *412#. N300 for 350MB: This is a one week plan that gives you 350MB data for 300 Naira which has a validity period of 7 days. To activate, dial this code is *417#. N500 for 750MB: Here is a two weeks data plan that gives you 750MB of data bundle for just 500 naira and it is valid for only 14 days. To activate it, dial this code *418#. N1000 for 1.5GB: This is a popular one month Airtel data plan that gives you 1.5GB data for 1000 naira only, and has a validity period of 30 days. To activate, dial this USSD code *496#. N1500 for 3GB: here is another one month data plan that gives you you 3GB data for 1500 naira only, and has a validity period of 30 days. To subscribe to this plan, dial: *435#. 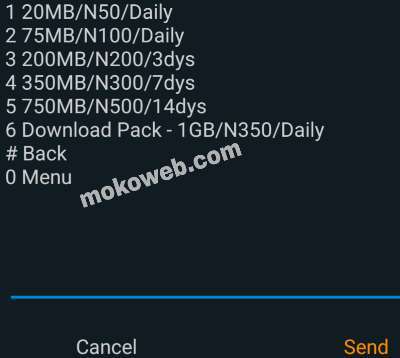 2000 for 3.5GB: With this plan, you will get 3.5GB Data bundle for 2000 naira and its validity is 30 days (1 month). To activate, dial: *437#. N2500 for 5GB: This is yet another one month data plan that gives you a whopping 5GB of internet data for only 2500 naira. It has a validity period of 30 days. To activate, dial: *437*1#. N3500 for 7GB: With this plan, you will get 7GB for 3500 naira which has a validity period of 30 days (1 month). The activation code is *438#. N4000 for 9GB: here you will get a whopping 9GB of data with just 4000 naira; it has a validity period of 30 days (1 month). The activation code is *438*1#. N300 for 250MB: this plan gives you 250MB data for 300 naira, and has a validity period of 25 days. The activation code is *885*1#. N525 for 200MB: this plan gives you 200MB data bundle with just 525 naira only, and has a validity of 7 days (1 week). To activate, dial: *440*17#. N50 for 20MB: with this plan, you will get just 20MB for only 50 naira, and it has a validity period of 24 hours (1 day). Activation code is *141# then select the first option. 3GB for 1000 Naira (Blackberry Plan): with this plan, Airtel gives you 3GB of data for just 1000 naira and it has a validity period of 30 days. Activation code is: *431#. All the above plans are termed “Airtel Smartspeedoo” plans for daily, weekly and monthly data bundles. Remember that terms and conditions applies. Smartconnect is Airtel’s default bonus plan for new prepaid customers and it gives you 100% INSTANT bonus on every data bundle plus 8 times bonus on every recharge. This offer valid for 3 months (90 days). To be eligible for this offer, you need to buy and register a new Airtel SIM card. Follow below guidelines. Purchase a new Airtel SIM Card. Insert the SIM in your phone. Recharge to start enjoying SmartCONNECT bonuses for the next 3 months. Below are some examples of smartconnect data prices, volume and bonuses. Interestingly, Airtel Nigeria is giving free 4GB data for all customers that upgraded to its 4G network whether you purchased a new 4G SIM or you upgraded your old SIM card. This free data can be used to browse any web page without restriction. It’s usable on all internet enabled devices such as smartphones, PC, Mifi, Modem, java phones just to mention but a few. And as we all know, 4G network is an upgraded version of 3G which means you will be able to enjoy faster browsing experience on the network better than before. So why not join the moving train and upgrade to the Airtel 4G LTE today. MEGA 5: here you will get 10GB data bundle for only 5000 naira which has a validity period of 30 days. To activate, dial: *452#. MEGA 8: with this plan, you will get 16GB data for 8000 naira, and has a validity of 30 days. To activate dial: *460#. MEGA 36: with this plan, you will get 50GB of data for 36,000 naira. It has a validity of 180 days (5 months). To activate dial: *406#. 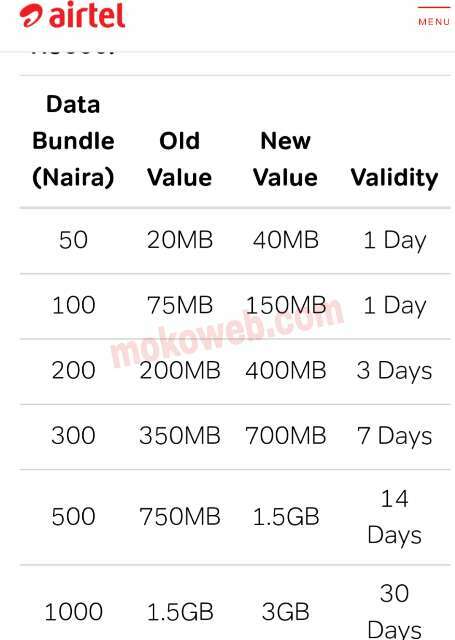 MEGA 70: here you will get a whopping data bundle of 100GB with only 70,000 naira. It has a validity period of 1 year (12 months). Activation code is: *407#. MEGA 136: here, Airtel gives you 200GB of data bundle for 136,000 naira. It is valid for only 1 year (12 months). Activation code is: *408#. UNLIMITED 10: with this plan, you will get an unlimited data plan for 10,000 naira with a validity period of 30 days. Airtel fair usage policy applies after the first 40GB used. To activate, dial: *462*10#. UNLIMITED 15: with this plan, you will get an unlimited data bundle for only 15,000 naira with a validity period of 30 days. Airtel fair usage policy applies after the first 65GB used. To activate, dial: *462*15#. UNLIMITED 20: with this plan, you will get an unlimited data plan for 20,000 naira with a validity period of 30 days. Airtel fair usage policy applies after the first 1000GB used. To activate, dial: *462*20#. Airtel night plan is a special data bundles for night crawlers who are able to stay awake in the night to browse the Internet. To be eligible for this plan, you need to migrate to Airtel SnartTrybe Tariff by dialing *312# to enjoy the cheap night browsing experience. 30% extra data on bundles of 500 naira and above purchased in Nigeria. Cool Night browsing: (25 naira for 500MB, valid between 12 midnight to 5 am). For more information, check Airtel Night Plan post on this blog mokoweb.com. Airtel social plans are cheap data bundles exclusively for accessing social media platforms such as WhatsApp, Facebook, messenger, Twitter, Instagram, Telegram, Snapchat etc. These data packages however, cannot be used to power every other applications on your mobile phone or to browse the Internet using your normal web browser although there is a trick to use VPN to tweak it and it’s called free browsing cheat. 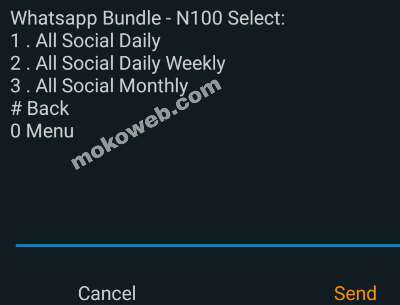 Enjoy 600mb for N300 to use whatsapp, Facebook, Twitter, Instagram, Telegram etc and it valid for 1 month although it’s actually 25 days not 30 days. 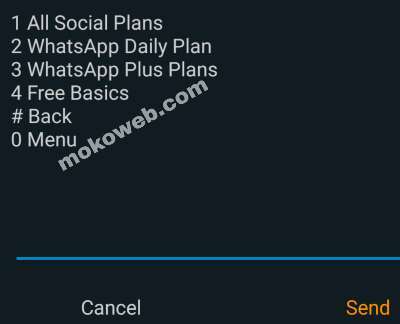 Other available options on the social plan includes whatsapp and whatsapp plus bundles. To activate any of these social plans, dial *141# >> select 2 >> then follow the instructions on your screen. YouTube is the worlds largest database for video uploads and sharing but requires internet data to stream or upload videos there. Therefore Airtel NG knows the importance of this platform so it made available a data bundle exclusively for youtubers. 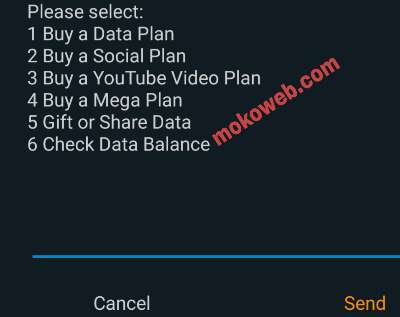 Below is a quick guide to activate YouTube data plan on the Airtel network. 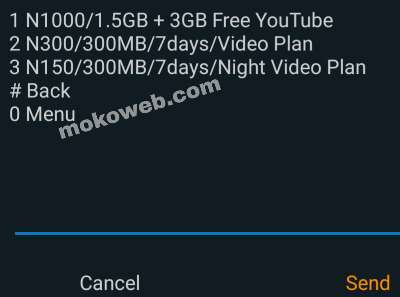 Normally, when you subscribe to the N1000 for 1.5GB one month data plan, you will get free 3GB YouTube data for streaming videos and uploading on YouTube. Additionally, you will get 150mb for N300 naira for night video plan as well. To activate airtel video plan, dial *141# >> then select 3 >> then follow the screen instructions. Freebasic is a platform that allows airtel subscribers who runs out of data plan and airtime to use facebook and other websites on freebasic for free but the disadvantage of this service is you will not be able to view all images and videos on facebook. You will also not be able to download any media file while on freebasic but it’s still a nice option to keep you connected online. Personally, I use freebasic sometimes to read posts on Nairaland forum, Naijaloaded and some top websites and blogs on freebasic. So you can equally utilize the opportunity for your own benefit although it’s not a data plan but I included it here to inform you of such offer in case you don’t know. Subscribers can easily share data on Airtel (no registration required) by using the following codes below. For example, if you want to share 60mb data to someone, you just have to dial *141*712*4*07019822069#. Note you should replace the above number with your recipients airtel phone number. You can also check your data bonus balance by dialing *223# and it will display results for both data balance and Airtime (credit) balance on your airtel line that particular time. For Airtel BIS (Blackberry): SMS “STATUS” to 440 or dial *123*9# for more info and details on data usage. Sometimes, after subscribing for an Airtel data plan, your phone still can’t brows or connect to the internet. In this situation, you must make sure there is enough and strong data service in your phone. I mean the E, Edge, H, H+ and 4G signals. Another cause of this problem is wrong APN configuration so apply the following settings manually if yours isn’t working. After applying the above configuration, you should be able to browse with your active data bundle and packages. TIPS: Once you subscribe to any data plan on Airtel, there will be an auto-renewal option so you either select “1” for allowing autorenewal or select “2” for disabling autorenewal option. There is also data rollover service anytime you resubscribe before the expiry date of your active plan. The network has also fixed the issue of data zapping which was prevalent two years ago so now you get value for your money. All these features makes Airtel one of the best data networks in Africa and Nigeria in particular. 1GB for 350 Naira Download Bundle Plan. 500MB for 25 Naira Night Plan. 4.6GB for 200 Naira Plan. That is all about all Airtel Data Plan in Nigeria for 2019. Keep returning to this blog mokoweb.com for more updates on Airtel and other networks in the country. Enjoy and have a blast!! !